Auto/biographical narratives of the Americas are marked by the underlying themes of movement and belonging. This collection proposes that the impact of the historic or contemporary movement of peoples to, in, and from the Americas—whether chosen or forced—motivates the ways in which identities are constructed in this contested space. Such movement results in a cyclical quest to belong, and to understand belonging, that reverberates through narratives of the Americas. The volume brings together essays written from diverse national, cultural, linguistic, and disciplinary perspectives to trace these transnational motifs in life writing across the Americas. Drawing on international scholars from the seemingly disparate regions of the Americas—North America, the Caribbean, and Latin America—this book extends critical theories of life writing beyond limiting national boundaries. The scholarship included approaches narrative inquiry from the fields of literature, linguistics, history, art history, sociology, anthropology, political science, pedagogy, gender studies, critical race studies, and indigenous studies. 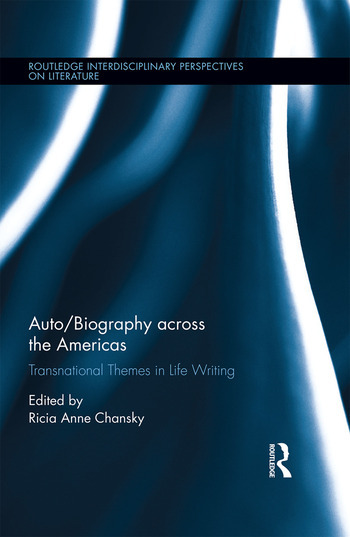 As a whole, this volume advances discourse in auto/biography studies, life writing, and identity studies by locating transnational themes in narratives of the Americas and placing them in international and interdisciplinary conversations. Chapter Nine: "See how I talk about the slavemaster"
Ricia Anne Chansky is Associate Professor of Literature at the University of Puerto Rico at Mayagüez. She is editor of the journal Auto/Biography Studies and co-editor of The Routledge Auto/Biography Studies Reader (Routledge, 2016).